The BBC has revealed that the international commercial News App for Apple's iPad, iPod Touch and iPhone that it has offered to foreign markets has hit 1.5 million downloads since it launched. The BBC News App was launched back in April - but the free offering has proven to be a popular application on the App store and not just inside the UK. More than 1.5 million people have downloaded the global application, and advertising deals mean that the overseas users have contributed back into the BBC coffers. 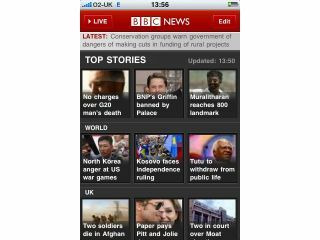 "The international commercial version of the BBC News app for the iPad, iPhone and iPod Touch has been phenomenally successful since it launched in April this year," said the BBC. "Over 1.5m downloads, the app consistently tops the news charts in various international markets. "The app has run advertising campaigns for a cross section of industry partners including Oracle, Cadillac, Continental Airlines, Barclays and IBM among others." BBC Worldwide - which looks after the licence-fee funded institution's business outside of the UK - is an incredibly important part of financing the BBC. With the decision by the government to freeze the licence fee for the coming years, BBC Worldwide will be keen to see commercial ventures, like the forthcoming International iPlayer, begin to generate money from people who do not reside in the UK.